Thursday, Dec. 20, 1888 Mercury 20°+ in morn, 34° P.M. but quite blustering making it seem colder tho' clear & bright. 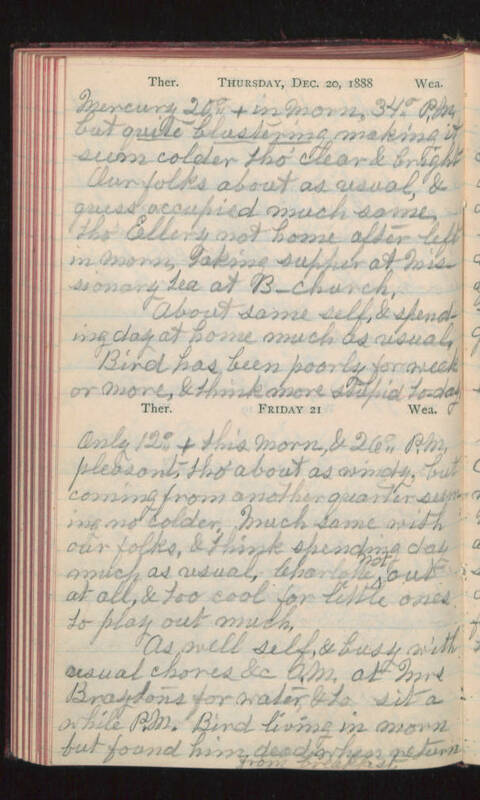 Our folks about as usual, & guess occupied much same tho' Ellery not home after left in morn, taking supper at Missionary Tea at B- church About same self, & spending day at home much as usual, Bird has been poorly for week or more, & think more (stupid?) today. Friday 21 Only 12°+ this morn, & 26° P.M. pleasant, tho' about as windy, but coming from another quarter seeming no colder. Much same with our folks, & think spending day much as usual, Charlotte not out at all, & too cool for little ones to play out much. As well self, & busy with usual chores &c A.M. at Mrs Braytons for water & to sit awhile P.M. Bird living in morn but found him dead when return from breakfast.